sweet lotus its, keerai.. but engae spinach matum thaan i get .. Very good reference material. I had a cook book in which they even said about various quantities used across the globe. But I lost the book. நம்ம ஊர்ல இத்தனை கீரை வகை பாருங்க.. There are much more varieties. Each being cooked differently. But all we get here is Spinach. Agaththikkirai is cooked in boiling water and then fried with coconut. Very tasty and very good for eyes. அரைக்கிரை is made by boiling and one round of mixing to make a pulp which goes very well with வத்தக்குழம ்பு. Murungai kirai is also cooked and fried to make a delicious side dish. It is also used while making ghee from butter. Hmmm!! When will I get a chance to eat all those varieties? என்ன இப்படி சொல்லிட்டீ ங்க, கொத்தமல்லி க்கீரை தெரியாதா? அதை வைச்சு சட்னி செய்வாங்கள ே? அப்புறம் ரசம், சாம்பார் இதுல எல்லாம் garnishing பண்ணுவாங்க ளே? But I missed ponnaanganni and manathakkali. I had them in my mind but was not able to pull it out. The Word Keerai is not the actual equivalent of the word Spinach . 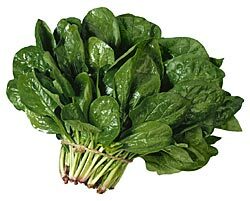 Then all the other leafy vegetables u mentioned, would not be termed as spinach. U can get all of them frm the Indian-Sri Lankan grocers over here. I love creamy spinach myself. Never guessed this would start a huge discussion on Spinach varieties. vendhaya keerai onu iruku.. superaa irukum..